Living in the world where humanity is on the verge of dying, there are always incidents in the news that restore our belief in the same. Another incident that's pleasantly surprising people all over the internet is the love these three boys have for their pet dog and how they bravely fought to save its life from a huge snake. The snake managed to wrap itself around the lower body and hind legs of the dog. 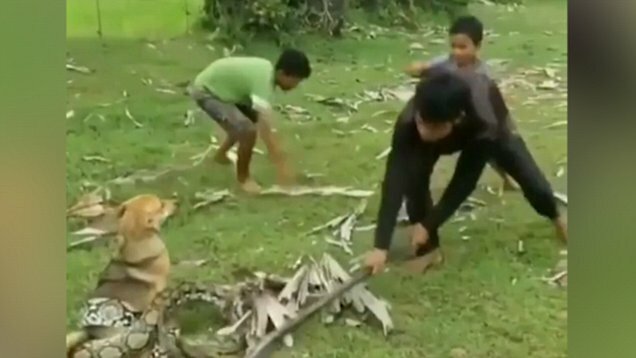 Without giving it a second thought the older boy is seen attempting to pin the snake's head supposedly with a metal table leg whereas the other two younger ones were seen struggling to loosen its grip on their pet dog by throwing large leaves at it. The little pooch seems to be rather confused by the incident. As difficult as this task seems the three boys left no stone unturned in helping the dog out of the situation. The three young and exceptionally brave boys managed to grab the serpent from both the ends pulling it in opposite directions, forcing it to relinquish its hold. Thanks to them, the dog was unharmed.